VANKLEEK HILL –The Higginson Tower Committee is collecting items for its silent auction which will take place on May 6 at the Vankleek Hill Community Centre. Because the gala dance and silent auction will raise funds for the restoration of the Higginson Tower, committee co-chair André Martel is soliciting items with a historic or nostalgic value. He is especially on the lookout for items pertaining to Vankleek Hill’s or local history. Martel is working with fellow committee member Phil Arber and Lorraine Poirier to collect vintage and historic items or souvenirs from Vankleek Hill to offer for sale on May 6. The committee is also accepting one-of-a-kind, hand-made items that will be tomorrow’s heirlooms or collectables, such as paintings, quilts, wall-hangings or furniture. “We are looking for items that are ready to display or use in your home. We won’t be accepting items that need repair,” said Martel. Preliminary work is already underway at the tower, Martel said. Some trees and brush have been removed from the area and material has been trucked in to create a temporary road on a grassy area on Arbor Gallery property. A chain link fence will be installed soon around the tower ruins in preparation for the archaeological dig, which is tentatively scheduled for late April and the month of May. Licensed archaeologists will undertake the dig around the base of the tower and inside the tower; members of the public will be able to participate in the dig at prescribed times to be announced closer to the dig dates. The estimated cost of the restoration of the tower to its circa-1904 use as an observation tower is $75,000 to $100,000. Nearly 20 volunteers are currently calling on individuals, companies and organizations for donations. These volunteers will have completed their canvassing by March 31. In the meantime, Martel has been meeting with the project architect, J. Denis Séguin of Vankleek Hill, to create a project schedule, prepare drawings and assemble a materials list. Champlain Township Mayor Gary Barton is a director of the Higginson Tower Committee, which is a not-for-profit corporation. Barton says that the restoration of the 175-year-old tower will be a great attraction for Vankleek Hill. “It’s going to blend in well with the historic homes in town and will be part of what we have to offer, blending in with the museum,” said Barton. The gala dance/silent auction on May 6 is another fund raiser for the restoration, as is the Champlain Time Capsule. You can visit the Higginson Tower booth and buy your personal time capsule kit for $100. Time capsules will be placed inside a container, to be placed inside a vault – all to be buried near the Higginson Tower this autumn. School classes, organizations, families, individuals and companies are invited to select memorabilia, photos or their stories for inclusion in their time capsules, which will be identified with the family, individual or group name on the outside of the capsule. The time capsule will be re-examined 25 years from now. Space inside the large container for all the time capsules is limited. The deadline for time capsule submissions is September 30, 2006. For more information about the time capsule, call Yves at 678-3000. If you have an item you would like to donate to the May 6 silent auction and you have questions or you would like to arrange for pick-up, call 678-2217 (days); 678-2691 (days); 678-3000 (evenings); or 678-5085 (days). Committee members are asking that all auction items be donated by April 22 so that a complete description of items and their history will be available to buyers on May 6. All those making donations to the project will receive charitable donation receipts from Champlain Township, which became the official owner of the tower and a portion of property in mid-February of this year, after the property was donated to the township by owner Phil Arber. You can send donations to the Higginson Tower Committee, Box 1010, Vankleek Hill, Ontario. 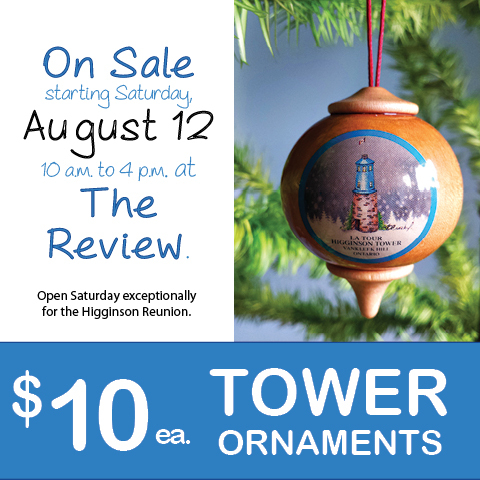 Information and pledge packages are available at The Review offices, or to find out more about the history of the Higginson Tower, its builder – Colonel Thomas Higginson, upcoming events and the restoration project, visit www.vankleekhill.ca and follow the links to bilingual information. The tower scrapbook page includes the recent addition of a 1963 photograph of the tower when the top portion was still in place.